The service is available on a 30-day trial basis for all users with Prime members getting a total of 90 days of free service on trial. Once the trial period expires, users will have to pay a monthly price of Rs 199 which will offer 1 credit every month that can be cashed in to use any audiobook regardless of its price. E-commerce giant Amazon has introduced yet another subscription-based service in India with the launch of Amazon Audible - an audiobook service that allows users to listen to their favourite books. The service comes at a starting price of Rs 199 per month and is currently in beta for Android and iOS users. Audible consists over 200,000 audiobook titles narrated by several artists across various genres and Amazon says it will add more Indian and international books in the future. The service includes the likes of Jeremy Irons, Stephen Fry and Jim Dale as narrators who’ll ensure a different listening experience when reading a book. Audible is also integrated with Echo Speakers, thus allowing users to ask Alexa to read a book loud. The service is available on a 30-day trial basis for all users with Prime members getting a total of 90 days of free service on trial. Once the trial period expires, users will have to pay a monthly price of Rs 199 which will offer 1 credit every month that can be cashed in to use any audiobook regardless of its price. Unused credits can be rolled up six times in the next few months and not more. Audiobooks that you have subscribed to, stay in your Audible library, despite cancelling of your membership with the option to swipe a previous book for a new one. 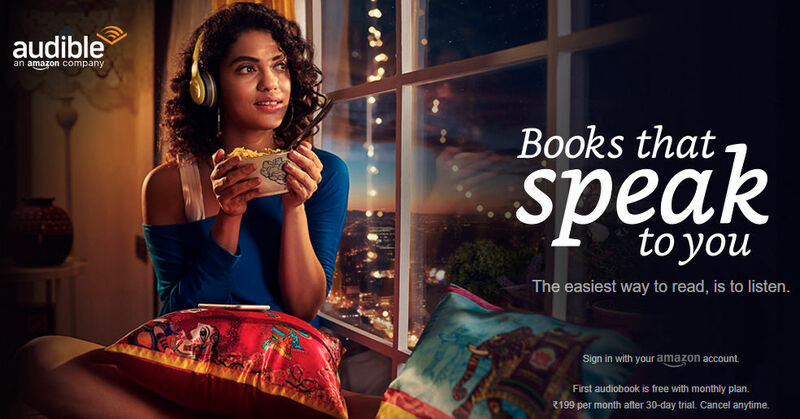 In addition to monthly payment of Rs 199, Audible also offers 1-month, 6-month and 12-month plans for Rs 299, Rs 1,345 and Rs 2,332 respectively. Standalone memberships can be made using credit/debit cards and net banking while monthly subscriptions can only be paid through credit cards and ICICI debit cards. Amazon Audible is currently available in beta phase on Android and iOS devices through a dedicated app and can also be accessed using the Amazon Cloud Player on the official Audible website.